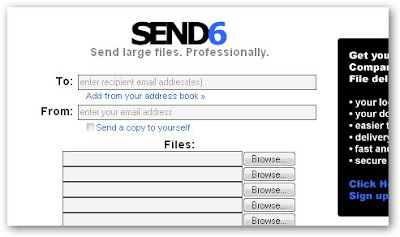 Send6 solves a common email problem: it lets you reliably send a large video file, graphics-heavy PowerPoint presentation, or other ungainly file via email. To use the service, you start by uploading up to six files at a time to Send6 (hence the name) and at the same time specifying 10 recipients who you want to receive the file. The recipients will get a link in their email inboxes with a special URL to download the files. Everything happens on one page so it's one of the simplest file hosting sites out there. The page design is also extremely clean. There are some limits, however. The maximum file size you can upload is 300 MB, and files are only kept 2 weeks. After that, they are automatically deleted. A similar service is Pando, which requires an additional software download.